Violent clashes between residents of the Jewish community of Havat Gilad and local Arabs, the latest in a series of Arab provocations. Violent clashes broke out late Sunday night between residents of the Jewish community of Havat Gilad and Palestinian Authority Arabs residing in the area, the Tazpit unit which monitors and documents events in Judea and Samaria reported. The reason for the clashes remains unclear, reported Tazpit, but eyewitnesses reportedly said that an explosive device was found on the road leading to Havat Gilad. Army troops were called to the scene, but it was later discovered that there was no explosive device in the area. The incident at Havat Gilad is the latest in a series of Arab incitements in the area. Last Monday, Arabs rioted near Neveh Tzuf, torching Maayan Meir, a natural spring where Neveh Tzuf’s Jews have erected a memorial and named it after one of the community’s founders, Rav Meir Segal. 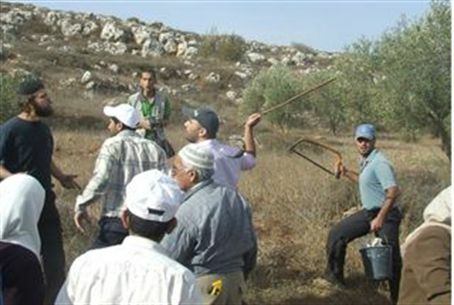 In the course of the confrontation, the Muslims set fire to Jewish owned vineyards and groves. Binyamin fire crews had to be called in to control the blaze but this took a long time because some of the crews were busy fighting another fire started by Arab arson, at nearby Kochav Yaakov. Click here for a photo essay of the Arab arson at Neveh Tzuf. On Friday, Arabs from Burin started a huge fire which came dangerously close to the homes of the nearby community of Givat Ronen. Firefighters who were called to put out the fire were pelted with stones.